Who is the Master Under 60 Ton Course for? The course is for anyone who wants a career or who is a Master or Captain in charge of a vessel, its crew members, passengers and/or cargo while the vessel is at sea or in the port. The Master controls and manages all aspects of the vessel’s operations. Responsibilities of the captain or mate include safe operation of the vessel complying with local and international law, ensuring safety of all personnel, the safe carriage of cargo or tow and preparation of voyage plans and maintaining records of the vessel’s activities. The course will prepare future Captains and Captain Mates, and Marines required to take a refresher course to perform duties for safe and professional marine conduct. Your Master Limited <60 (under 60GT) Certificate of Competency will be limited to a named vessel (or sister vessels within a fleet), other information will include the named vessel type, gross tonnage and area of operation. 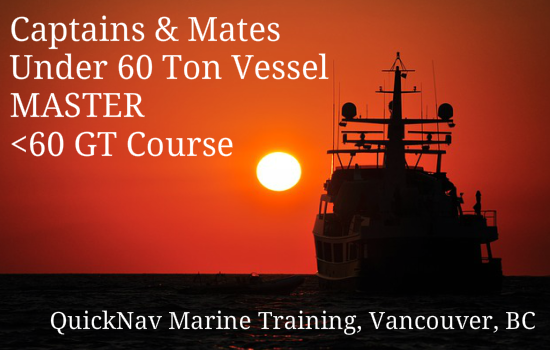 This 40 hour 5 day course provides you with the knowledge to be able to sit the Transport Canada Master or Chief Mate< 60 GT written and oral examinations. It is for those requiring a refresher for chart work along with the bouyage system, rules of the road and collision regulations. Determine course to steer allowing for current and leeway. Contact QuickNav to gather current courses and complete course information required regarding the operation and the vessel type and gross tonnage, to which the certificate relates. Spaces are Limited, Book Today!